Garden Apartments: Type C ) 4 people - 60 square meters about . Apartment disposed on two levels ( open space ) with 1 room at groundfloor divided by low partition in zone day / zone night with king-size bed ( 2 adults ) +upstairs openloft with two single beds ( 2 boys or adults ).Bathroom with shower .Kitchen corner equipped.Terrace equipped.Outside big common porch , WiFi free , ping pong , badminton , swing and slide for the most little , a barbecue , private park car , sun heated shared swimming pool , common laundry . Renzano is a simple small village in hilly area at 185 metres of altitude and just 900 metres from Salo' town and Garda Lake ( 15 min' on walk about ) . The area is temperate in winter while in the the summer evenings enjoy the cool breeze of the Lake. At the Agriturismo Renzano Garden Apartments you can relax in the splendour of a wide panorama unique in the nature of the High Garda Natural Park and spending Your holiday away from the noises of traffic and town all this without find yourself in a place too isolated . 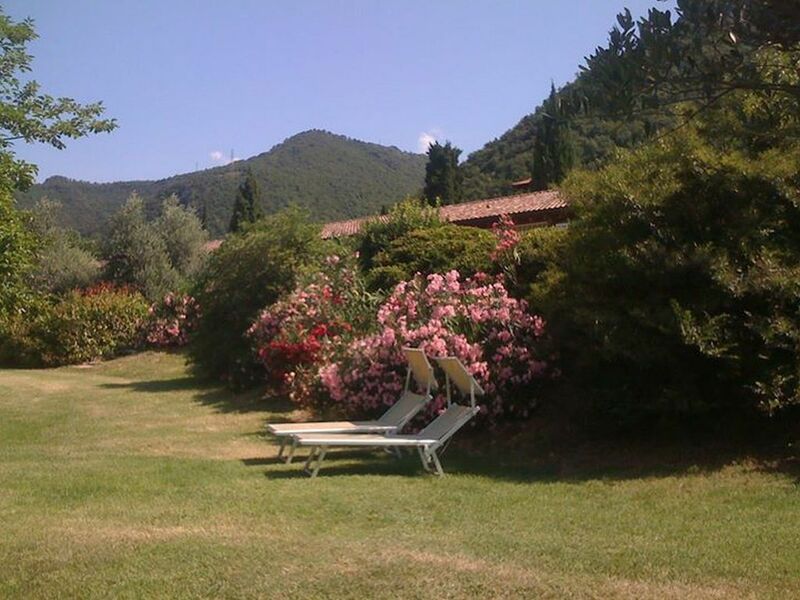 Then the quiet is guaranteed with real and exclusive opportunity to have always a verdant space all for You enjoying of the big garden that Agriturismo Renzano Garden Apartments put at Your disposal . The swimming pool surrounded by nature , the deckchairs scattered on the grass at sun or at shadow of a tree , the open barbecue where do Your grilled , a spacious common porch where play ping pong or watch on Tv Your favorite sports events all togheter or connect in internet with a wifi free service and why not , also a numbered parking car closed and private for Your car are the details that certainly make the holiday more serene . The Agriturismo Renzano Garden Apartments is also surrounded from its typical Lake Garda olive grove where are produced the olives for the excellent Extra Virgin Olive Oil. A near bikes / scooters external renting center and the nearest pizzeria , a pastry bar are at 300 metres about on walk and if it can interest You we are on the first natural path of High Garda Natural Park and so the possibility to do walking not lack . Needless to list what the Salo' can offer with its beautiful bay lined by the beach and the promenade full of shops, bars and restaurants and the entire Lake Garda with its hinterland can offer to those who like sports , to those looking for a cultural holiday, who food and wine, some fun .... and those who do not want to do nothing and enjoy the spectacle of nature. With windows , shower , bidè , mirror , hairdryer . One weekly supply of Bed linens is included . A share to be paid extra to use . Wifi free in the common area . One weekly supply of bed linens and bathroom towels are included . To pay extra on request additional supply . The food can't be provided from management . Paper and rags not supplied. Our guests have the nice use to leave or take the books . Ping pong free use ( in covered area ) , in the garden badminton free use . A wide garden where you can find a quiet space exclusive for you . Beach chairs equipped free use .Moreover in front each apartment a little separated and private space/garden 3x4 metres about . Each apartment has a nice private porch on ground floor equipped withy garden table 4 seats and two garden chairs , half covered from wooden roof and half with a solar tent . 12 x 5x 1.20 , open from 20 May till 20 September , flexible date weather permitting. Free use , shared , not controlled so kids never alone . The Washing Machine and Barbecue are in the common area . Bed Linens and Bathroom towels are provided . Towels for beach / pool are NOT provided . Linen for kitchen are NOT provided . Vittoriale degli Italiani . Gardaland . Giardino botanico Heller . Parco Sigurta' . Terme Sirmione . Grotte di Catullo . Zoosafari .Arena di Verona . THE RATES ARE REFERRED TO APARTMENTS TYPE C FOR '" FOUR PEOPLE " . Required Deposit of 150 eur cash only to be given at check-in and returned at check out. No breakfast / restaurant service. No smoking apartment . Self catering apartment. Pets not allowed .